I hardly notice the change, but then she looks up and smiles at me, and I see train tracks. Pink train tracks on a face that is changing. We had to watch that Brady Bunch episode when Marsha gets her braces. Twice. Marsha managed to get several dates to the school dance even with her braces on. Not that I want that for Sailor. But I'm just saying, I think if it's OK for Marsha, it's going to be OK for Sailor too. So far, only one person has called Sailor "BRACE FACE." And it was me. But I said it nicely, as in, "Aw, come here, my little brace face." Her brother, in a rare moment of compassion, said, "Sailor, I think you look even prettier with braces on. I wish I could get braces, too." But then, he felt embarassed by his heartfelt admission, and hid his face in a zorro mask for the rest of the afternoon. I wish I had a zorro mask that I could hide behind whenever I embarass myself. But then, I might not ever come out. I could save a lot of money on mascara. But I digress. I wanted to make a big pot of comfort for my little Marsha Brady. The January copy of Cooking Light had a stunning display of chilis (not to mention some very tempting carrot cake pancakes), and I fully intend to make them all. I started with Three Bean Vegetarian Chili, and I made the whole durn thing in the crockpot. Fantastic, friends-truly fantastic. And maybe even ultra-fantastic the next day. You know what else is fantastic? All of your kind comments about Sailor's braces. You are just the kind of people that I love to count as my friends. You made Sailor feel like a million bucks, so that's how much I owe you. Have a great weekend, everybody. Use dried beans of any variety, soaked over night in this recipe to save a few bucks. You might need more liquid, but you won't need to alter the cooktime. You can swap the butternut squash with canned pumpkin. Add all ingredients to the slow cooker. Cook on high for 3-4 hours, or on low for 6-8 hours. Garnish with sour cream and green onions before serving. PS Don't forget to vote for my crazy kid in the Jif Peanut Butter Contest. Just follow the link over to cast your lot for West's More Rockin' Moroccan Peanuty Pitas. Next Up: Carrot Cake Pancakes? Or one last Crockpot Soup? I wish I could look that good with braces on! She looks adorable and quite grown up, like the perfect age for baby sitting four little cousins this weekend :) just kidding. We all think she looks beautiful and now all my kids want to put a paperclip in their mouth and pretend they have them, too. i love west's hiding place. and sailor's brace face. and i just might make this for dinner tonight. One more crockpot soup please! The veggie chili looks very good to me. My hubs wouldn't eat it though. He would fuss at the lack of meat. Some things just won't change. I wish I had looked that cute when I had braces. And I hope, although I know it's impossible, that when I am lucky enough to have braces again as an adult, that I could look that cute. She looks adorable. She really does. And the chili looks delish! I never had braces and I definitely did the paper clip in the mouth thing. I was so jealous of the kids with braces...braces were so cool! Sailor looks just darling in those braces...she really does! And West hiding behind the zorro mask is pretty classic too. I am off to vote for your recipe now, Zorro. Oh, and I would like 100 more crock pot soup recipes, and the carrot cake pancakes while you're at it. No pressure! Thanks for Sharing the chili. I love to do dried beans in the crockpot, but I was always uncertain what how much dried beans I should substitute in a recipe that calls for cans. 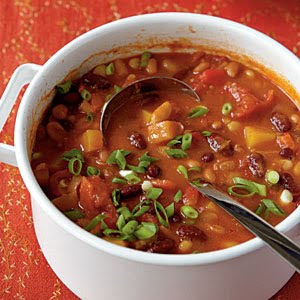 Did some googling and just wanted to pass along what I found "According to the American Dry Bean Board, one 15-ounce can of beans equals one and one-half cups of cooked dry beans, drained." Hooray! THANKS for all these vegetarian friendly/ adaptable crock-pot recipes! This is like the 3rd or 4th in the last couple of weeks! When I got married someone gave me a slow cooker cookbook, and although I am sure the recipes in it are all lovely, I have only tried the mac and cheese, since it is the only one I can find that doesn't call for a pork shoulder, or a whole roast. Thanks for Sharing! P.S. Sailor looks darling as usual! Sailor looks completely at ease in her new braces! And tell her from us that she is fortunate to be playing the violin because all of Lynn & Kevin's friends who have gotten braces not only had to get used to eating and brushing their teeth with them, but also how to play their instruments! I'm with Ali, one more crockpot soup! The kids are just adorable! As for this chili...one of the best aspects of winter is using the Crockpot often! She has shiny, new train tracks. 8 Years old and in braces! Your children are going to do everything at a breakneck pace aren't they? Well, just tell her not to chew on the ends of any pencils, especially the ones that have a missing eraser. I somehow managed to get the end of a pencil that had a missing eraser stuck in one of my brackets, and had to go in for serious repairs. Anyway, her teeth look great and so did Zorro. I fear my daughter is headed for the braces as well. How old is she? That was cute what you said about your son. I too wish I had a Zorro mask! THis bean chili looks totally amazing! Welcome! Sailor is only eight and a half, but she has a crossbite that has to be repaired. She may have to have braces twice!!! She looks adorable with her braces and I just love the pink! She is such a beautiful girl. this recipe looks and sounds just like something I would love, love, love!! It is a must try really soon. Oh she's adorable! Loving the pink too! This is right up my ally. Ben's trying to eat healthier, and he loves soups. Thanks for the Bean Chilli recipe. I've printed it out to try for myself. Did you enjoy it? I really enjoyed this soup. The rest of the family, not so much. I think if I lied and told my husband there was meat in it, it would have been received better. oh well, more for me! And braces are so different these days -- she is such a cutie. OH, I hate it when that happens! My family loved it, even my husband, who usually shies away from meatless foods. I'm glad you liked it at least! Aww don't worry about it! She looks very very cute with braces! She's one of the lucky ones haha I remember some people really looked bad when they had theirs put on. i love the smile of the kids. Hello i'm kavin, its my first time to commenting anyplace, after i read this paragraph i believed i could also generate comment as a result of this wise paragraph. women and men don't wear their uniforms offbase/home/ on leave? Indeed, I get your level in the TEF difference in between these two amounts. But, is not a 45% protein consumption everything you recommend? Therefore, it's not just for illustration, but is the consumption individuals ought to have for better unwanted fat loss. I concur that protein intakes larger than the SAD (15%) are good for losing wt and keeping it off. But, again, I am curious on how you settled on 45% protein? Why not recommend 60% as this would potentially elicit a 400% increase in TEF relative for the SAD intake and possibly lessen appetite even more? Also, why not use a particular g/kg/day consumption recommendation instead of the % of calories. According to Layman and others, the strategy determined by size (total BW or lean tissue) is probably the better approach to keep the proper intakes when there are hypocaloric intakes. make NO sense. If a prohormone isn't a steroid then that makes it a supplement, indeed? Effectively, you also mentioned that supplements don't work, right? So, what is a prohormone simply because proh confident as hell operate. charged with sexual? battery? lol this is just also excellent!